Now does this sound familiar to you, or not? Those disciplined and trained in the ways of traditional marketing would be shaking their heads, saying, these are essentially marketing and advertising principles. The definition seems like it's been strung together by picking out various components of marketing elements. In doing so, makes itself sound like the de facto marketing guru in modern day business. Some people swear by content marketing, while others - like me - take it more with a pinch (well, a big pinch) of salt. For those in the latter camp, the rise in subscribing to and believing in the idea of it obliterates much of the knowledge and experience gained in the line of work. 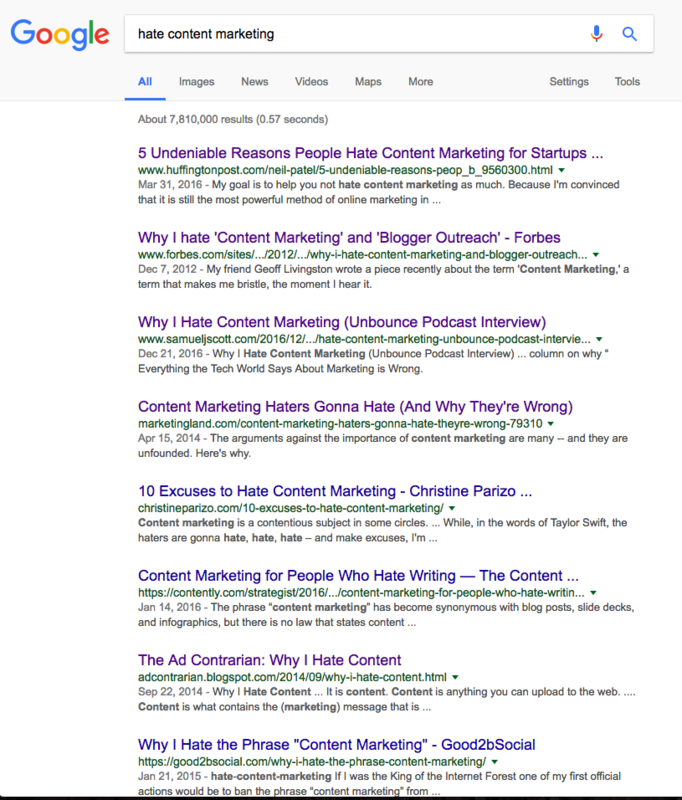 This is why Googling the words ‘content marketing’ and ‘hate’ brings up countless other articles, much like this one. What has shaken up content marketing as we know it, however, is the advent of the digital age. With the Internet, consumers have not only become smarter, but also a lot more discerning. Just two decades ago, brands were in full control of their marketing messages. In the absence of free-flowing information, consumers took marketers at their word and brands didn’t suffer backlash from misleading advertising. Today, brands have to be careful of what they say and how they say it to avoid being boycotted. Remember United Airlines, Uber, Pepsi and Breadtalk? And these are just a few of the examples. This new dynamic has put a lot of focus on how marketers craft their messages and their campaigns. So, it seems like ‘content marketing’ really is just another way of expressing traditional marketing principles in this digital age. To make it more relatable to the current landscape, I shall henceforth interpret content marketing as the dissemination of valuable information in the form of texts, visuals or videos on the online platform. Now that the Internet has such a low barrier of entry, it seems like anyone can publish or upload just about anything. This has resulted in a major content overdose, most being meaningless and useless. To make matters worse, marketers have been led to believe this mantra: Put out as much content as you can; the more you do, the more likely a customer will land on you. When the objective of putting out content becomes a mere quantity game, more often than not, the quality of the content would suffer. This would in turn, affect the usefulness of the content as well. Remember that the power balance between brands and consumers have since tipped in the latter’s favour. Now, they can choose to skip over an ad to get to a YouTube video, or read the first paragraph of a blog post, and hit the ‘x’ button if they don't like anything they’re watching or reading. To prevent getting passed over, marketers have to be really conscientious about the content they produce for the World Wide Web. The sheer amount of available ‘content’ (and as of late, fake news) has made consumers more conscious of what they choose to pay attention to. All they really need is the right information to make an informed choice. When they believe the messages to be true and accurate, there is a higher likelihood that they will buy more from the brand. Take Dove’s long running Real Beauty campaign for example. Through research, Dove found that only 2% of women globally considered themselves beautiful (Etcoff, Orbach, Scott, & D’Agostino, 2004). The brand used that statistic to create an awareness campaign about beauty standards. Dove also debunked the media’s standard of ‘beauty’ by showing how makeup and digital alterations can make an average woman look like a supermodel. This gave women the confidence to not conform to society’s beauty standard and encouraged them to own their beauty, whatever their shape is. The campaign’s success in sharing real personal stories sparked a trend of redefining beauty standards. Perhaps the best way to talk about relevance is to use an example of irrelevance. In 2013, Nesquik created a random day called National Bunny Ears Day. They also created an accompanying hashtag (#nationalbunnyearsday) and an app which added cute bunny ears into pictures. Unfortunately no one cared for a made-up day dedicated to bunny ears, mimicking a mascot they can’t relate to. The moral of the story: content has to be relevant for consumers to engage - the bunny ears could’ve taken off if Nestle chose run the campaign during Easter instead. Consistency is mentioned most because of how the mind gets conditioned. It is how people learn to identify and respond to stimulants in their environment and through repetition, brings about a change in behaviour. How did we come to know that BMW is about performance driving? The brand used the tagline ‘The Ultimate Driving Machine’ consistently for 40 years, before changing it to ‘Sheer Driving Pleasure’ only a few years ago. In contrast, Chevrolet changed their tagline 18 times since the 1950s, making it difficult to solidify a perception. This results in consumers not being able to relate to the brand, only to the products. In order to create information that is valuable, relevant and consistent, marketers have to know who they want to reach out to. Trying to target their message to the masses will not work because it will not mean the same thing to everyone. That said, it is also not enough to identify a segment, because this represents a collective group of people with varying needs and wants. So, crafting content requires a deep understanding of consumers within the identified segments. It has to be granular. The team behind P&G’s Swiffer Wet Mop identified its target audience as women who wanted a product with convenience. When this message didn’t work in Italy, the team dug deeper and found out that strength of cleaners is more important to Italians instead. This prompted P&G to rework its messaging, which eventually resulted in huge success of the brand there. A deeper understanding of the target audience also means that marketers can identify the right touch-points for their messages. Aside from increasing the effectiveness of outreach, it also maximises the value of ad spend. If, for example, Facebook isn't highly utilised to search for a B2B service, why should it be advertised there? A platform strategy is therefore essential to achieving maximum engagement with all the different target audience segments - and this, of course, starts with a deep understanding of consumers. It’s not that I actually hate content marketing but rather, it’s the misguided attention it has received that can at times make projects difficult to manage. For content marketing to work, marketers will have to remember the basics of marketing principles: applying the right strategy and objectives, identifying the right target audiences, creating the right content and deploying the right channel strategy. AKÏN uses an in-house methodology to develop a brand strategy that may be right for your company. Find out more about the Human Brand Methodology here. Previously part of our Business Development team, Raine was tasked with strengthening AKÏN’s business core through building up clientele, forming partnerships with other agencies to increase capabilities, and exploring potential expansions in the range of marketing services offered. She is now a management consultant at BDO Singapore. 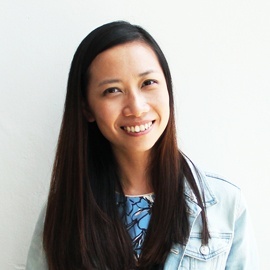 Raine is a Marketing and Communications graduate from the Nanyang Business School, Nanyang Technological University (Singapore). A solo traveler, she allows her wanderlust to take her places; she enjoys long discovery walks across these cityscapes, and capturing sunrises with her photographic eye.